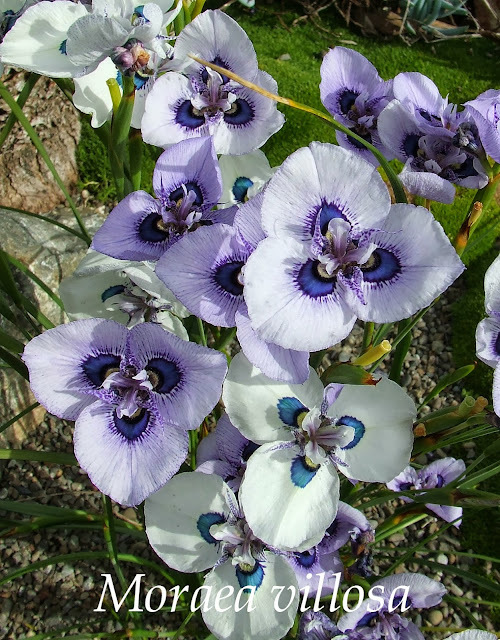 Insanely beautiful, commonly known as 'The Peacock Iris', Moraea is a genus of plants in the family Iridaceae (Yip, that's the 'Iris Family'). This is the species 'Moraea villosa' blooms from September to October, and flowers last several days. The more white looking blooms are from bulbs that were sold labelled as 'Moraea aristata' the endangered species but I very much doubt that they are M.aristata. Still with a display like this whats to complain??? 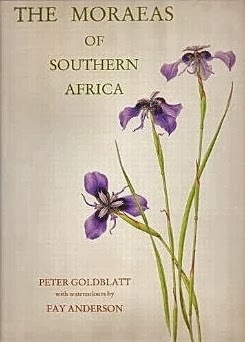 Moraea villosa is endemic to the Western Cape of Africa and was once renown for mass spring flower displays in the Cape lowlands, sadly not so common nowadays as their habitat has been replaced with wheat fields and urban sprawl. Plant is now classified as vulnerable. In New Zealand both bulbs and seed can sometimes be purchased online but only in very small quantities. The Moraeas of Southern Africa. National Botanic Gardens in association with the Missouri Botanical Garden, Cape Town. Goldblatt, P. 1986. I am very fond of Botanical paintings and I appreciate the watercolours in this book by Fay Anderson, both the plants portrayed and paintings themselves are absolutely stunning. The Iris Family: natural history & classification. Timber Press, Portland, Oregon. Goldblatt, P. & Manning, J.C. 2008. Thought I would take the photo today before the thunderstorm weather we are getting this spring lays the blooms to waste. Posted by Iris Hunter at 6:40 PM Labels: Goldblatt, Iridaceae, Moraea villosa, P.